The first point worth making is that Roberto Quartin’s 1970 recordings of Victor Assis Brasil Esperanto and Toca Antonio Carlos Jobim (now combined by the Brasilian-centric) UK label, FarOut Recordings is extremely life-like; this is, indeed one of those rare cases where the quality of the instrument(s) comes across as vividly as the quality of the playing of Victor Assis Brasil, which is first-rate-flawless. In fact it was that instrument – the saxophone – that consecrated its prodigiously gifted practitioner long before these recordings were made, before he even travelled to Berklee College of Music via Austria and Germany, where he put a singular stamp on his interpretations of Jazz music, funnelled through a unique Brasilian vision. What constitutes interpretation? Surely every artist worthy of the name as Victor Assis Brasil was, sought to internalise the message of the music he chose to perform in the hope of sharing an exceptional perspective with the audience both at home and abroad. In the best cases, that perspective is highly individual, shaped by myriad factors, including age, training (however personal and individualistic), culture, intelligence, imagination, curiosity and life experience, among countless others. Certainly the best music – as is the case of these eleven tracks by Victor Assis Brasil – invites a variety of approaches. Indeed, and specific to these two albums, the saxophonist’s fascination with the Jazz canon is the constant revivification, the new insights and artistically satisfying experiences such varied, individual responses can produce. Listening to Victor Assis Brasil’s two very different albums – one, as its title suggests, endorsing the universality of the Jazz music language, and the other using that very language to re-interpret the sanctified canon of Brasil’s patron saint (Tom Jobim) – is a reminder that the search for a uniquely personal interpretation of Jazz can, and does, veer just that appropriate distance from the beaten path (both ways) to remain fresh and completely and exceptionally distinctive. For instance Victor Assis Brasil, who “heard” the saxophone – viscerally and intellectually – most singularly in his early search for an identity, almost of necessity produced a sound that was completely his own; dry yet redolent of the iridescent sand that he carried and absorbed from his carioca feet upwards into his heart and very soul. Thus, on his own compositions on Esperanto which imitate most closely the Jazz aesthetic the saxophonist is both ebulliently carioca-like, seductively annunciating impossibly personal feelings of saudades and alegria into the boundless energy of “Children”, “Marilia” and others, including into the opener, Jimmy Heath’s “Ginger Bread Boy”. Conversely he brings all of the tonal riches, individuality and power he developed on the instruments into the much quieter eloquence of Tom Jobim’s gorgeous repertoire – from the breathtaking “Wave” to the bewitching “Dindi”. 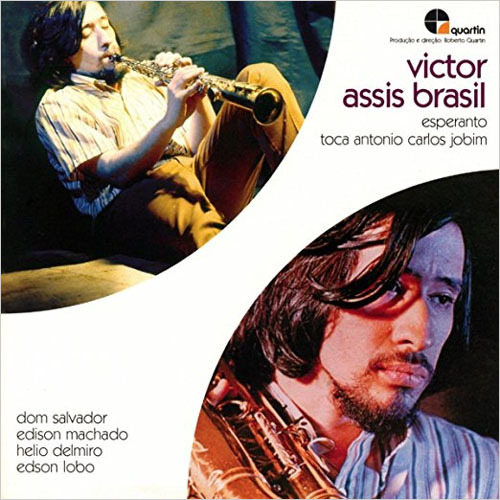 All the while we (also) marvel at the contributions of the magnificent pianist Dom Salvador (heard here on piano and electric piano), guitarist Hélio Delmiro, bassist Edson Lôbo, drummer Edison Machado and Claudio Roditi on piston oboe (on “Children”), all of whom are completely attuned to the vision and genius of Victor Assis Brasil.